Entrepromotion Magazine: 3 Killer Events to Build Your Biz in the Next Two Weeks! 3 Killer Events to Build Your Biz in the Next Two Weeks! 3 AMAZING Events to Build Your Biz in the Next Two Weeks! 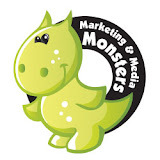 Marketing and Media Monsters Marketing Show - BE A PART OF OUR LIVE STUDIO AUDIENCE! 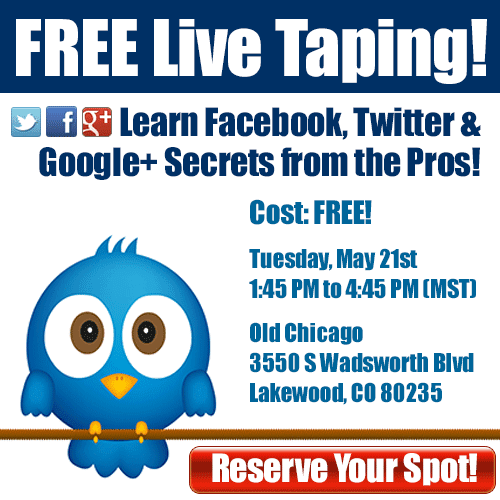 Rebekah Welch (the Colorado Connector) and Tara Jacobsen (Marketing Artfully) are having an live taping where you will get to hear our top tips for using Facebook, Twitter and Google Plus effectively in your business. As always, this will be practical info that you can use immediately upon leaving the event! This is behind-the-scenes access and YOU get the bonus of being able to ask us anything you like about marketing your business! No charge, no sales, just a fun time had by all! 50+ REGISTERED & CONFIRMED TO ATTEND! 303Network’s NETWORKING IN THE CITY suburban events offer the opportunity to meet colleagues representing products and services in an engaging, unique atmosphere. Popular along the front-range for “Business Networking with a Social Flair”, this social “business after hours” event is designed for members to meet and build relationships with representatives from Metro Area companies and organizations of all sizes representing a variety of industries. Each event and co-sponsors present to their guests an opportunity to mingle with 75 -150 or more business community members for an unforgettable experience, making each and every event distinctive. 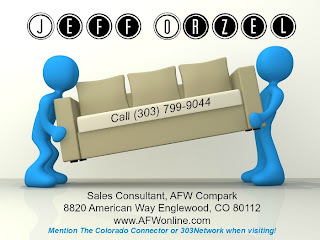 "Business Networking with a Social Flair"
PLUS appetizer & drink specials AND prize giveaways! From Rookie to Rockstar, Social Media Summit! Have you been hearing about social media marketing and have no idea where to start OR are you good at social media for yourself, but not sure how to make social media work for your business? There is an “expert” behind every bush to tell you what you should be doing…but what if you KNEW that by spending just two days, you could save yourself months (or even years) of anguish trying to figure out how make this POWERFUL marketing channel work for you and your business!!! Now imagine you could find out what 8 of the best social media experts in the country are doing right now to rock the social media world? That dream becomes a reality on May 29th and 30th when you join us for the From Rookie to Rockstar, Social Media Summit! This two day powerhouse event will give you the tools you need to make the most of your social media marketing efforts. Hear the best of the best including Joel Comm, Vicki Conley, Stephanie Hillberry, Kevin Knebl, Andrea Vahl, Lori Gama, Viveka Von Rosen and Rose Chaimberlain. Just the chance to hear one of them could cost hundreds of dollars, but you get all of these speakers for just one tiny fraction of what it would cost to see them separately! 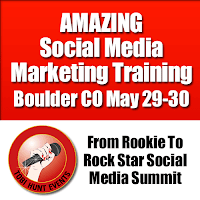 From Rookie to Rockstar Social Media Summit! 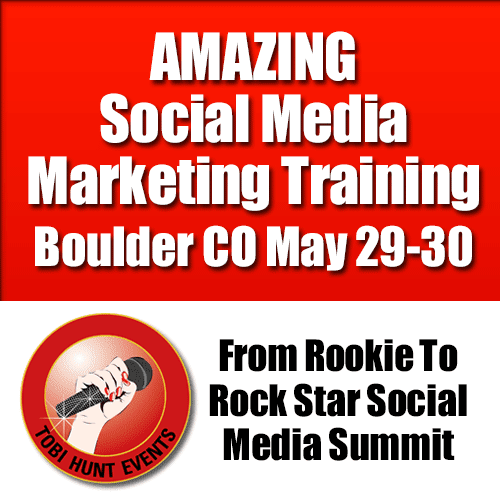 This two-day social media extravaganza is presented by Tobi Hunt Events. Tobi is the mastermind behind some of the most successful training and networking events offered in the Denver and Boulder areas and this one is sure to be a success! Each day includes vendor tables, fabulous networking exercises, world-class speakers, continental breakfast, and a delicious hot buffet lunch. JOIN US by completing your registration at the links provided. SEE YOU THERE! Can’t make it? PLEASE Forward to a friend!